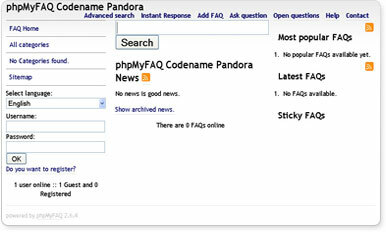 phpMyFAQ is a multilingual, completely database-driven FAQ-system. It supports various databases to store all data, PHP 5.2 (or higher) is needed in order to access this data. phpMyFAQ also offers a multi-language Content Management-System with a WYSIWYG editor and an Image Manager, flexible multi-user support with user and group based permissions on categories and records, a wiki-like revision feature, a news system, user-tracking, language modules, enhanced automatic content negotiation, templates, extensive XML-support, PDF-support, a backup-system, a dynamic sitemap, related articles, tagging, RSS feeds, built-in spam protection systems, LDAP support, and an easy to use installation script.